SBI PO Interview Admit Card 2018: The State Bank of India's examination conducting wing has released the admit card for the upcoming SBI PO recruitment exam 2018 on its official website. The Candidates who have applied for the SBI PO (Probationary Officer) examination can now download their respective SBI PO Interview admit card from sbi.co.in. SBI PO Interview Admit Card 2018: State Bank of India has published the issued SBI PO Interview Admit Cards for the candidates who have qualified for the interview round of the recruitment process of Probationary Officers post in SBI. 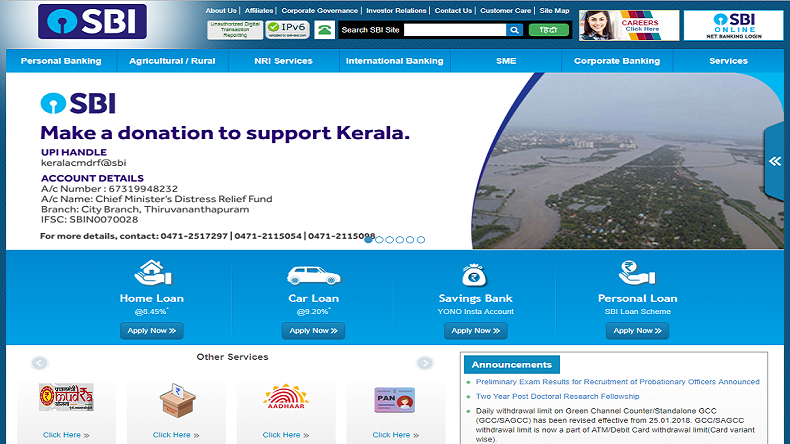 The candidates can now log in to the official website of SBI – and download the same by entering their registration numbers given on the specified field online. The SBI PO Interview 2018 will be conducted by the organisation from September 24 to October 12, 2018 after which the selected candidates will be absorbed in the organisation as Probationary Officers. The SBI PO Mains 2018 exam was conducted by the SBI on August 4, 2018 and its result was declared on August 28, 2018. According to reports, candidates who have been successful in qualifying both the SBI PO Prelims 2018 and SBI PO Mains 2018 examinations will be appearing for the interview round. Meanwhile, the SBI PO Recruitment process comprises of three stages, preliminary, mains and the group excercise or Interview round finally to recruit the best eligible candidates in the organisation.